Rodding USA's Issue#2 is Sold Out. 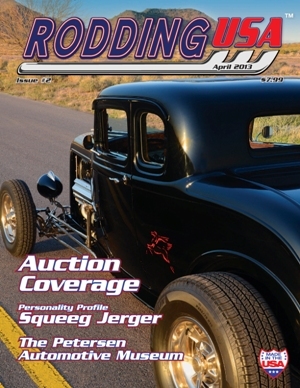 Rodding USA's second magazine features two masterpiece features expertly photographed by Editor Paul Martinez. First up is Joe Proski's fabulous '50 Merc: After 23 years, 60,000 miles, two rebuilds and now in Candy red paint we think Joe's Merc really nails the custom car look. Then there's Rod Palmer's cool hemi-powered deuce coupe. This is a real rags-to-riches story and the end result is a hot rod you'd have to consider as being a winner! These are backed by an additional four hot rod features plus special interest features which includes a Personality Profile on hot rod industry icon Squeeg Jerger who's quite a character. We also take a look inside the real-deal Petersen Automotive Museum and then we lift the doors on a hot rodders' garage and take a look at how to create your very own special place. Want to know what collector cars and hot rods are really worth? Our second issue event coverage features extensive articles on the auction scene where we cover the Barrett Jackson, Mecum and Russo-Steele auctions held just last month plus coverage of the Kansas City World of Wheels show. If you're into doing it yourself then check out our tour of Industrial Metal Supplies, It's sure to get the nod for inclusion on your list of "my favourite places" plus we look into Shop Air and delve into the necessities of Electrical Relays for your hot rod too! Not forgetting, we showcase new products and much more.